Stir the lime zest into the blueberry muffin batter. Divide the batter evenly among the six muffin cups. Slide into the oven and bake according to package directions. Once the muffins are done, allow them to cool slightly. Meanwhile, stir together the lime juice and confectioners sugar. Drizzle the glaze over the muffins. Let sit for a little while for the glaze to harden. You know that you are both “a regular” and someone with a quirky habit when the cashier at the grocery store checkout remembers your daughter’s very specific request for her very predictable snack. Every time. See, whenever my daughter and I grocery shop during the week, she asks for one of those big bakery muffins that are way bigger than she could ever eat. Maybe once every two weeks, I say yes. So into the white bakery bag it goes, and at the checkout, she asks to hold it. Or she did, until the cashier started doing it automatically. The thing about those muffins? They are just too big for little girls. And they are pricey. Making muffins at home? Way more economical. Although I typically bake muffins from scratch, sometimes there just isn’t time for that. And when there isn’t time, it’s helpful to have a little trick to doctor up easy muffin mix in seconds. If you have a lime and a bag of muffin mix, then you are ready to make this simple recipe. 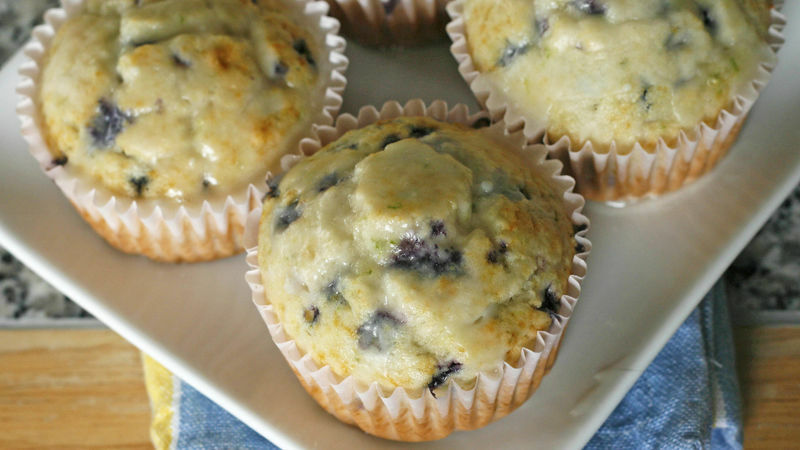 These Easy Lime Blueberry Muffins with Lime Glaze are tangy, small muffins dotted with blueberry bits. They are super simple to make, but have that fun twist that makes them a little extra special.